A monster that resembles a dinosaur that existed in ancient times. It sweeps everything away with its two well-developed arms and its gigantic tail. It is extremely easy to tame due to its intelligence and docile personality. 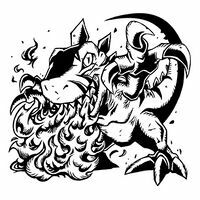 Its Special Move is scorching the opponent with its flame breath (Fire Breath). A monster that resembles an ancient dinosaur that existed in the prehistoric world. It sweeps everything away with its two well-developed arms and its gigantic tail. It is extremely easy to tame due to its intelligence and docile personality. The attacks from its two developed arms are formidable. It's Special Move is Fire Breath. 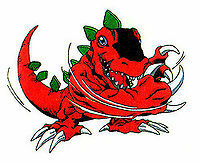 A Digimon with an appearance resembling an ancient dinosaur. Although it looks scary, it is actually obedient and it is relatively easy to tame due to its intelligence. When a battle breaks out, its combat instinct awakens and it rushes forth, sweeping everything away with its two well-developed arms and an attack from its gigantic tail. 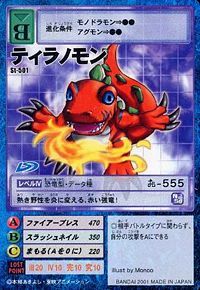 Fire Breath  ファイアーブレス Faiā Buresu Blaze Blast/Fire Blast/Fire Breath Spews deep crimson flames that are the same color as its body. Slash Nail  スラッシュネイル Surasshu Neiru Slash Claw Slashes the opponent with its sharp and powerful claws. Gives off a powerful kick. 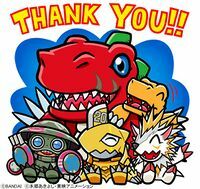 Several Tyranomon are servants of Etemon. The first one appears in "The Fairy! Piccolomon" and is destroyed by Greymon. In "Digimental Up", a group of five Tyranomon is controlled by the Digimon Kaiser's Evil Rings. They are freed from the rings by Pegasmon and Nefertimon. 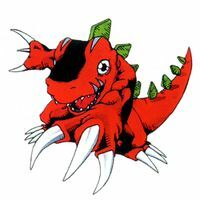 A Tyranomon was among the many Digimon seen through the rip in the sky during Vikaralamon's rampage. A herd of Tyrannomon were seen running, and suddenly killed by Omegamon. The bunch of them were seen as a part of Silphymon's rebel group. 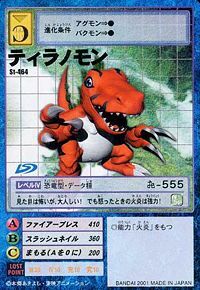 A Tyranomon is pictured as one of the Digimon killed by Kurata Akihiro's forces. 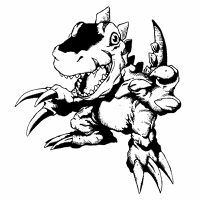 Tyranomon appears as an obtainable Adult-level Data type Digimon in Digimon World. After the Player gets past Amida Forest and recruits Centalmon, it will lead to the Ancient Dino Region where the Player will be confronted by a Tyranomon that happens to be guarding the region and a battle is engaged. 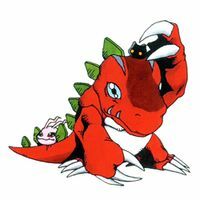 After Tyranomon is defeated it opens the gate and the player can access the Glacial Time Zone where time passes much slower, and starts guarding the Speedy Time Zone. 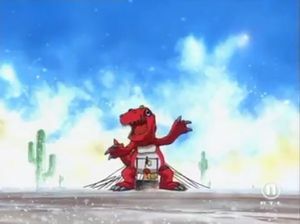 If the Player attempts to cross the Speedy Time Zone, he will be stopped by Tyranomon saying its dangerous to go there as time elapses much faster than usual, but after the Player's insistence to salvage the File Island Tyranomon is convinced to open the gate as he noticed that a meteor fell in that area and things went strange and warns the Player to be careful as their Digimon may ask for more items and may die faster. The meteor is later revealed to be an Insekimon and after a battle the Player returns to Tyrannomon, where it'll refuse to join the Village of Beginnings until a Master Tyranomon comes, scolds and orders him to join the city, replacing him as the guard of the Gate. In the Village of Beginnigns Tyrannomon works in the Restaurant, along with Meramon, Yukidarumon, Garurumon, Vademon and Digitamamon. 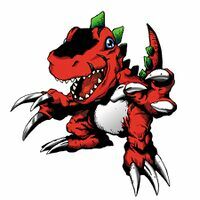 If none of the aforementioned Digimon was recruited, Tyranomon will build the Restaurant. Tyranomon's Digivolution item is the White Fang which lets any Child Digimon evolve into Tyranomon. 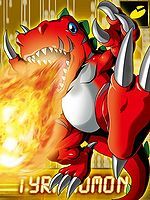 Tyranomon spits various flames out of its maw towards the enemy. 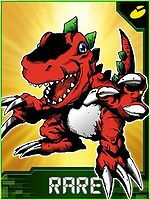 Tyranomon is an obtainable Digimon. 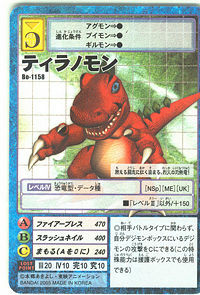 Evolves from Elecmon (0-2 DP) and can evolve to Triceramon (0-7 DP) or Master Tyranomon (8+ DP). 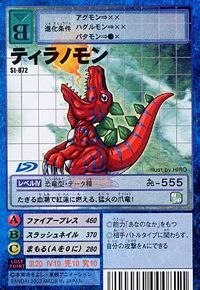 Tyranomon appears as an opponent and an obtainable Red Card. Evolves from Goburimon. 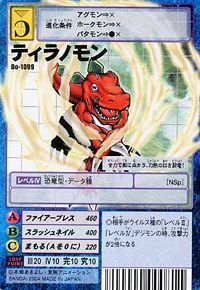 Can evolve to Triceramon. 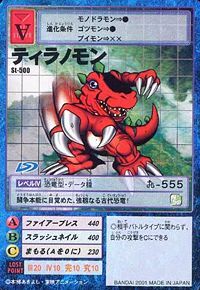 Tyranomon is an obtainable Digimon. 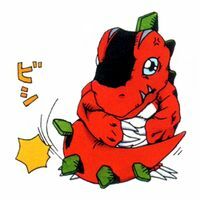 Evolves from Guilmon and can evolve to Triceramon. 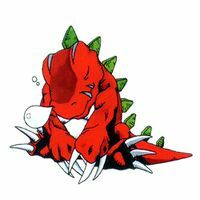 Can also be Jogressed with Airdramon to get Aero V-dramon or with Raremon to get Ex-Tyranomon. Evolves from Agumon. Can evolve to Metal Greymon, Metal Tyranomon or Skull Greymon. 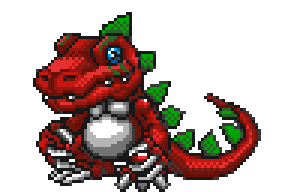 Can be evolve from Guilmon if above Level 16, Attack 75 and Friendship 50 or can be found in Pixel Dessert. 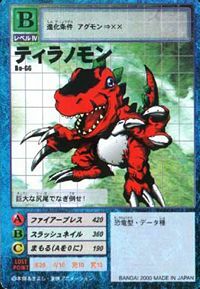 Can evolve to Master Tyranomon if above Level 36, Attack 160 and level cap 40 or Tyramamemon if above Level 33, Defense 105, and Speed 90. Evolves from Agumon. Can evolve to Mamemon. 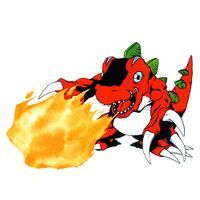 Evolves from Agumon, V-mon or Guilmon. Can evolve Metal Greymon, Metal Tyranomon, Aero V-dramon or Megalo Growmon. Can also be Jogressed with XV-mon (Pendulum Progress 1.0), Witchmon (2.0) or Aquilamon (3.0) to get Paildramon or with Airdramon (D-Scanner 1.0) to get Megadramon. Evolves from Falcomon, Mushmon, Goburimon, Swimmon, Gottsumon or Terriermon when the requirements for the other evolutions are not fulfilled. 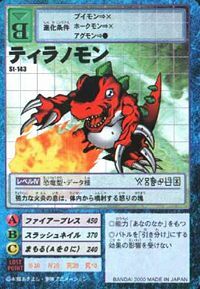 Can evolve to Yatagaramon or Triceramon X-Antibody or be Jogressed with Diatrymon to get Yatagaramon. Its anger solidifies and is shot out in a blast of fiery breath. It has a docile personality, despite its scary looks! However, it unleashes a powerful fire attack when it gets angry! This tough, ancient dinosaur has awakened to its true battle instincts! This powerful red dragon turns its hot, wild temperament into flames! As its blood boils, this clawed dragon spews fierce flames that burn crimson! It beats down with its giant tail! 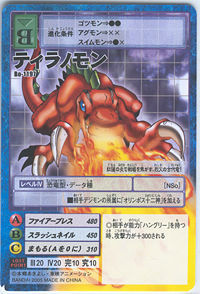 This scorching red fighting dragon charges towards opponents with all its strength! 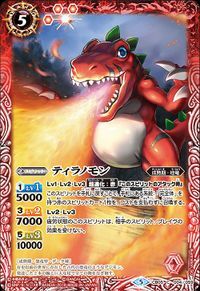 This scorching dragon of raging fire is dyed red with its burning fighting spirit! This ancient dragon of raging fire scorches the battlefield with its crimson flames! 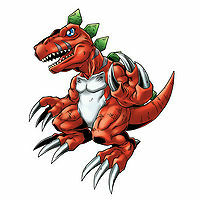 A Digimon that resembles an ancient dinosaur that existed in the prehistoric world. It sweeps everything away with its two well-developed arms and its gigantic tail.